L21 is pleased to present Lágrimas de cocodrilo, an exhibition by American artist Paul Cowan. 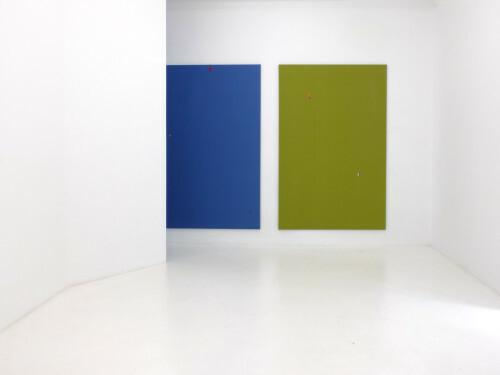 The walls of the gallery have been repainted with a common latex paint. Mixed into the paint, there is a muguet essential oil, lily of the valley, slowly exhausting itself in the space. Upon the walls hangs a new series of monochrome ‘lure’ works. Composed of colored canvas with a subtle record of wrinkles and folds of their material past. These grounds are pierced with fishing lures; store bought and hand painted ‘spoon’ lures and hand tied ‘flies’. Standing in as a compounded and commodified mark they reveal their repercussive tendencies while surfacing the concept of editing specific to painting and extending beyond. The lures offer something to consume but not to process, flavor but no nutrients. Their hyper-real tendency creates a playful resistance that outmodes their real predecessor of baitfish and insects, giving way to the imitation and simulacra at play and developing a dialectical relationship between being an observer and a contributor to the tradition of painting. Paul Cowan (1985, Kansas City, USA) lives and works in Milwaukee, WI. His solo shows include: Clifton Benevento (New York), Jonathan Viner (London), Young Art Gallery (Los Angeles), Shane Campell (Chicago), Golden Age (Chicago) and Green Gallery (Milwaukee), among other. Paul Cowan group shows include Annarumma Gallery (Naples), SWG3 Gallery, (Glasgow), DUVE Gallery (Berlin), James Cohan Gallery (New York), ICA (Philadelphia), Museum of Contemporary Art (Chicago), Important Projects (Oakland), Thomas Duncan Gallery (Los Angeles) and Cell Project Space (London), among many others.